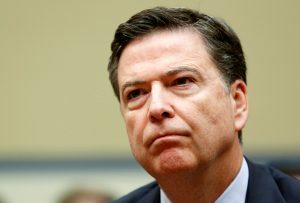 WASHINGTON — House Democrats still seething over FBI Director James Comey’s handling of the election-year inquiry of Hillary Clinton confronted the law enforcement officer over his refusal to say whether the FBI is investigating possible links between President-elect Donald Trump’s campaign and Russia. The contentious, closed-door session Friday reflected the frustration of Democrats who blame Comey’s statements and actions in part for Clinton’s loss to Trump. In July, Comey announced the findings of the FBI investigation that found Clinton’s use of a private email server was “extremely careless” but not criminal. Then, days before the Nov. 8 election, he sent two letters to Congress, one announcing a review of newly found emails and then another saying there was no evidence of wrongdoing. Trump and his supporters have staunchly resisted the findings and Trump has leveled a series of broadsides at U.S. intelligence agencies, even though he’ll have to rely on their expertise to help him make major national security decisions once he takes over at the White House next week. He will be sworn in Jan. 20. In testimony to the Senate on Tuesday, Comey refused to say whether the FBI was investigating any possible ties between Russia and Trump’s presidential campaign, citing policy not to comment on what the FBI might or might not be doing. “I would never comment on investigations — whether we have one or not — in an open forum like this so I can’t answer one way or another,” Comey told the panel. Late Friday, the Senate Intelligence Committee announced it would investigate possible contacts between Russia and the people associated with U.S. political campaigns as part of a broader investigation into Moscow’s meddling in the 2016 presidential election. — A review of the intelligence that informed the declassified report about Russia’s interference in the election. — Russian cyber activity and other “active measures” against the United States during the election and more broadly.